Phonetics and linguistics form an integral and important part of the education of SLTs, and its teaching requires different methodologies and assessment approaches than those generally found on traditional courses. This book collates the expertise of teaching phonetics and linguistics and presents it in an accessible and practical format. 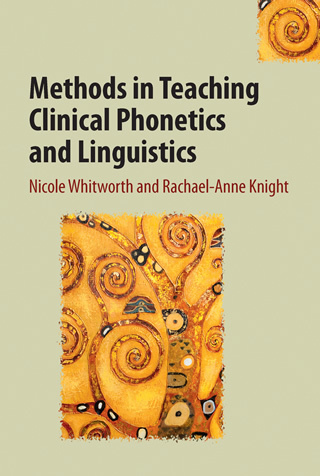 It highlights the teaching and assessment methods of teachers in this area, and aims to showcase the best practice of teaching and learning in clinical linguistics and phonetics. Nicole Whitworth is Principal Lecturer at Leeds Metropolitan University and her specialist areas are clinical phonetics and phonology, the phonetics of voice, the anatomy and physiology of speaking and hearing, a well as bilingual and monolingual language acquisition. Rachael-Anne Knight is a Senior Lecturer in Phonetics at City University London. Her main research interests concern speech prosody (intonation and rhythm) and rhotics (r-like sounds). Rachael-Anne regularly reviews articles for journals such as the Journal of the International Phonetics Association and the International Journal of Language and Communication Disorders.